Telstra has undergone significant shifts in its customer service strategy with its efforts to remain competitive and uphold its consumer promise. Speaking at ADMA’s Techmix, Telstra’s general marketing manager, Keiron Devlin, shares his insights into the challenges, successes and what’s on the horizon when it comes to cross-channel optimisation. “Telstra has been very single minded about where we put the customer, in terms of every experience and every decision that we make within the organisation,” he said. Devlin said when he first started at Telstra he was given a revenue score card, and while it had advocacy and customer satisfaction alliances on the score card, it didn’t seem to bear any weight in terms of the organisation’s end of year remuneration. As part of the cross-channel optimisation process, Devlin rolled out the 'first 100 days’ customer program, which aimed to provide new customers with a seamless welcome and on-boarding process, regardless of channel. The result was that it drove a whole lot of cost in the business and Telstra was losing the ability to build relationships with customers during a very critical time in its customer lifecycle, he said. “The insights we were presented with were that we had a horrendous first 100 days experience,” he said. “We communicated to our customers over 90 times in the first 100 days. We generated over 400,000 calls to be able to deliver customer’s coming through and generated a whole lot of cost in our business because we badly managed those customers. According to Devlin, Telstra has 40,000 people in Australia in the organisation and while the intent is always good, a lot of the time the people are competing against each other and typically duplicate their efforts. “Everyone was trying to have a conversation with the customer – and often that was a competing conversation that made no sense because it didn’t actually build on any conversation we previously had with a customer,” he added. To remedy the situation, Telstra introduced a new way of working to ensure the organisation was having a more consistent conversation with the customer in the first 100 days. The theme Devlin said he keeps heading is that Telstra’s people are traditional marketers, so they don’t typically understand the new technology environment. Understanding the technology and how it can better support what the organisation needs to do is critical in moving forward, he said. 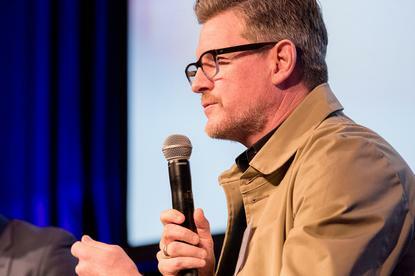 “When it comes to content, we had five agencies providing content for different parts of that experience, so we’re pitching now to make sure we have one agency that’s responsible for content,” he said. Telstra also made changes in its email capability simplifying from initially having five email platforms down to just one. “We decided to stick with one partner and build one relationship,” Devlin said. “We had a panel of nine mail houses, we went out and found the best mail houses. We now work with one mail house that supports us across our programs at work, and that allows us to help build that relationship. When it comes to engaging across multiple channels, Devlin explained it’s as much about opening up new and emerging channels, as looking at existing ones. “You talk about emails, social and emergence and they are developed channels,” he said. “We typically chose traditional channels to communication with our customers, example – every month we sent out 330,000 welcome packs through direct mail to our customers, at a significant cost and significant effort. Moving forward, Devlin said the opportunity to move into some of the more social channels, even the integration process, is absolutely critical. “We like to integrate a number of platforms in our ecosystem, we have a number of partners and we’re making sure we’re bringing them all together, so we’re able to leverage the benefits of all of those different partners,” he added.